The displayed content may differ depending on the type of meter. Tachometer displays the engine speed in revolutions per minute. Multi-information display presents the driver with a variety of driving-related data. Trip meter reset knob switches the trip information. Shift position and shift range displays the selected shift position or selected shift range. Engine coolant temperature gauge displays the engine coolant temperature. Switches between the trip meter �a� and �b� displays. 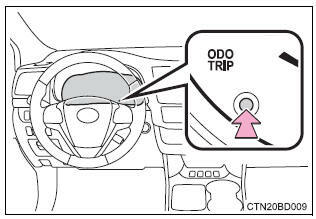 When the trip meter is displayed, pressing and holding the knob will reset the trip meter. The brightness of the meter panel lights can be adjusted. Pressing the button will adjust the brightness of the meter panel lights. The brightness level of the meters when the surroundings are bright (day mode) and dark (night mode) can be adjusted individually. However, when in day mode, adjusting the brightness level will also change the brightness level of night mode. The engine switch is in the "on" position. In the following situations, the correct outside temperature may not be displayed, or the display may take longer than normal to change. 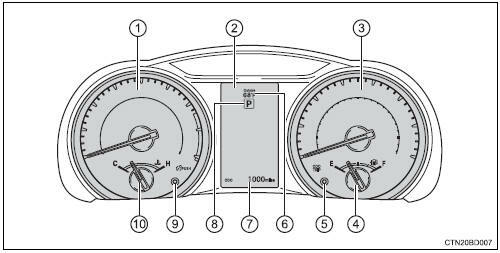 Do not let the indicator needle of the tachometer enter the red zone, which indicates the maximum engine speed. 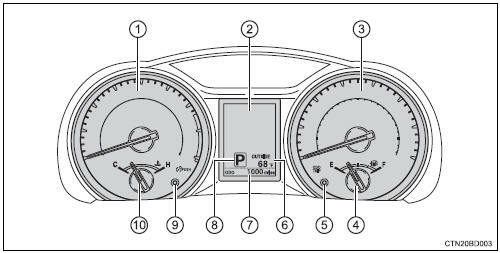 The engine may be overheating if the engine coolant temperature gauge is in the red zone (h). 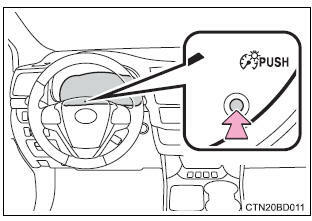 In this case, immediately stop the vehicle in a safe place, and check the engine after it has cooled completely.